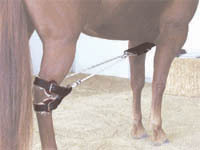 Redesigned in 2003, the Mare Breeding Hobbles are durable and easy to use. The Hobbles are constructed of nylon webbing with fleece-lined Hock Straps. The Rope Assembly features a panic snap on each end for quick release. 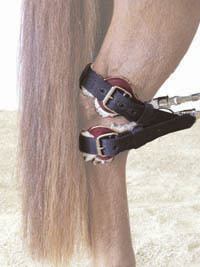 To select the correct size hobbles for the mare, two measurements should be made. First, measure the mare's height in hands from the ground to the top of the withers. 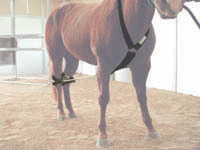 Next, weigh the mare using either a livestock scale or weight tape. Refer to the chart to select the correct size.